Not far from Annecy, the Semnoz mountain in the Bauges range holds a fantastic ski resort known as the Balcony of the Alps. Part of the Massif des Bauges national park, the mountain is full of surprises all year round, whether it’s snow or sunshine you’re seeking. 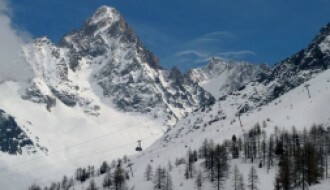 From traditional Savoie villages around the base of the mountain to the fabulous summit of Crêt de Chatillon, this is a superb position from which to enjoy the French Alps. 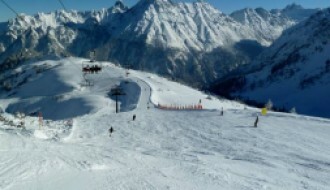 Le Semnoz is a resort often revered for being accessible from some of the best spots in the Savoie region, and a great destination for skiers of all ages and abilities. When you’re looking for things to do in Le Semnoz, the slopes are the first thing to check out. There’s a freestyle snow park with a range of modules and jumps. Slalom between fir trees down the slopes then take the lift back up to appreciate the 360-degree panorama of the mountain. 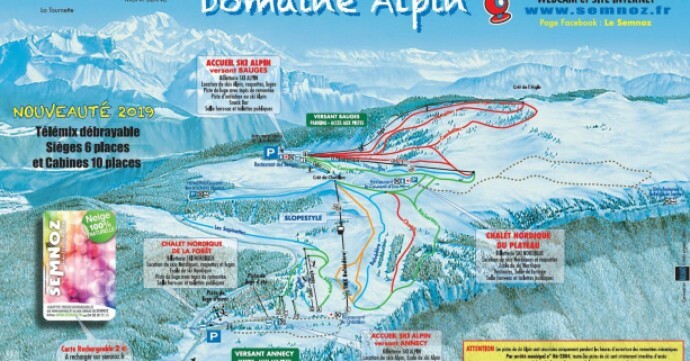 There are runs suitable for beginners, intermediate or advanced skiers, with an Alpine Ski School on hand for additional lessons and refreshers. There’s also the chance to try your hand at luge, with the track set near a stunning Nordic chalet. Or you can rent sledges and enjoy the specially designed play area; fun for young and old. To discover the mountain at a gentler pace, head to the forest or plateau centres to hire some snowshoes. A qualified guide and instructor will show you the highlights of the Semnoz mountain scenery, or you can head out and explore on your own. With regular events such as the Biathlon and the Semnoz Grandprix, snow fans are never short of something to do. During the summer months, nearby Annecy is the place to be, with numerous exciting landmarks, gorgeous parks, and nature spots and fun excursions. Why not take a Segway tour of the city, exploring everything from cobbled back streets to the sparkling coastline? According to the weather report, Le Semnoz is blessed with cool temperatures throughout the year, protecting those perfect ski slopes. In summer, mountain walkers might experience temperatures of up to 19 degrees, with plenty of sunshine, so don’t forget the sunscreen. 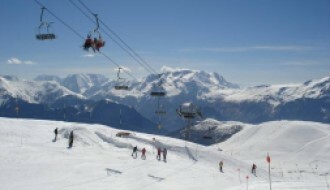 For an up to date weather report, take a look at our Le Semnoz resort guide here. The first restaurant appeared here in 1872 and was simply called Restaurant Semnoz. Today, visitors can enjoy variety from at least eight different eateries in the resort, with many more just a short drive away in the city of Annecy. Snack bars on the slopes provide fuel between ski jaunts, while restaurants such as Les Rochers Blancs serve a wide range of traditional Savoie flavours in a relaxed environment. Experience the weird and wonderful Venetian Carnival every February in Annecy. Over 300 masked revellers silently stalk the streets and pose for photographs. In the summer months, the city streets are taken over by street artists of all kinds. Jugglers, poets, stuntmen and more provide mesmerising entertainment for the whole family. Lake Annecy is a protected natural space that offers many activities including plenty of water-sports. Visit on the first Saturday in August to experience the Feast of the Lake, a festival where fireworks and music combine to produce a show like no other. There is also the extremely popular pastime of summer tobogganing. An 850-metre course winds through lush, green meadows and trees. This unique way to experience the mountain, with tunnels and jumps, will thrill children and adults alike. In this property investment guide, Le Semnoz comes alive as a natural paradise for skiers, hikers, and lovers of family life. Living in Le Semnoz could mean looking at lively urban hubs like Annecy or exploring more peaceful areas at the base of the mountain such as Quintal. Buying a property in Le Semnoz involves checking out quaint cottages that seem traditional from the outside but are hiding modern amenities such as heated pools. Or it may mean a huge family home with five bedrooms, just minutes from the city centre. Looking at the snow report Le Semnoz appears to have around 50 days of snow a year, with a summit max depth of 145cm and a base depth reaching 145cm. The most snow falling at one time tends to be around 40cm, meaning the mountain landscape can change dramatically and beautifully in a very short space of time. This stunning scenery makes Semnoz a desirable destination all year round. For updated snow reports, take a look at our Le Semnoz resort guide here. The Le Semnoz resort is about a twenty-minute drive from Annecy, meaning it’s very convenient for airport access. Access by road is also available from Seynod, Sevrier, Saint Jorioz, Leschaux, and Bauges. There are regular updates online about the viability of the roads and the weather. In addition, there’s a shuttle bus from Annecy which runs several times a day, with several stops along the way which include prominent restaurants and hotels.